Lawrence Technological University (LTU) has surpassed the $100 million mark in its “Proud Heritage, Bold Future” capital campaign, and construction is scheduled to begin in the fall on the first phase of the A. Alfred Taubman Engineering, Life Sciences and Architecture Complex (TELSA). 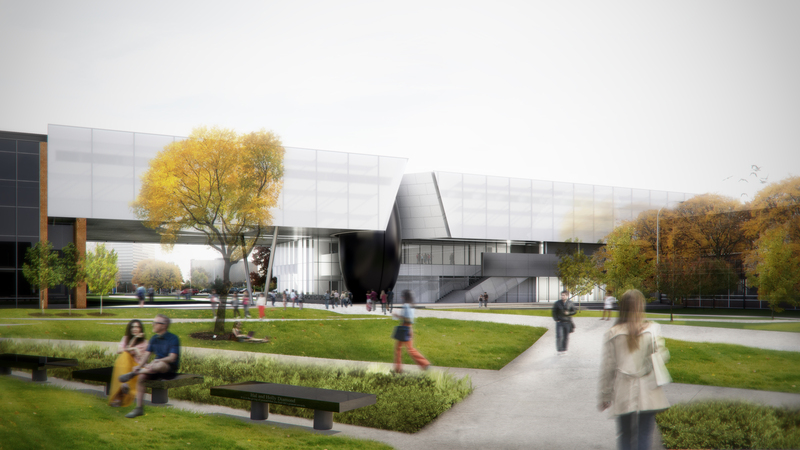 The architects at Morphosis envision a bold design for LTU’s new academic building that will enclose the southeastern corner of the campus quadrangle. A spheroid stairwell will provide a focal point. “We are pleased to be able to launch and complete the construction of the first phase, while continuing fund-raising efforts to complete this entire new complex,” LTU President Virinder Moudgil said. The 125,000-square-foot project is the top goal of the capital campaign and has an estimated price tag of $55 million. The design architect is Thomas Mayne of California-based Morphosis, and the architect of record is the Detroit-based Albert Kahn Family of Companies. Construction costs will be approximately $15 million for the first phase, a three-story structure of 34,000 square feet that will be connected to both LTU’s Science Building and Engineering Building at the southeast corner of the campus quad. The new building will provide advanced facilities for robotics engineering, biomedical engineering, life sciences and several related programs, including an office to promote progressive strategies for teaching science, technology, engineering and mathematics – the STEM disciplines. A new engineering building has been identified as the university’s top priority. The building is designed to create a collaborative learning environment that brings students and faculty closer together and to further promote the interdisciplinary cooperation between LTU’s College of Engineering, College of Arts and Sciences, and College of Architecture and Design. “The new facility will be designed to accommodate such emerging programs as robotics and biomedical engineering that draw upon the expertise of multiple fields of study,” said LTU University Architect Joseph Veryser. The new building will be named for former LTU student A. Alfred Taubman, the shopping mall pioneer and noted philanthropist who donated $1 million to cover planning for the new building and offered a $10 million challenge grant that has now been matched by over $20 million in new pledges for the construction of the building. LTU’s current “Proud Heritage, Bold Future” campaign was launched in 2007 with a goal of $75 million. That goal was attained in early 2013, and anonymous donors pushed the campaign above $100 million when they pledged $20 million to be paid over three years. Most of the campaign’s gifts and pledges have been committed to academic programming, research, scholarship and Lawrence Tech’s endowment. More than $30 million in pledges and cash has been committed to the new building and another $20-25 million will be needed in order to complete the second and third phases, according to Steve Brown, vice president of University Advancement. As a private university, Lawrence Tech is funding the TELSA complex totally through the philanthropy of alumni, corporations, foundations, and other friends to avoid any impact on student tuition. To contribute to this project, contact Brown at 248. 204.2305 or sbrown@ltu.edu. Also this year, LTU will begin construction on its third residential hall for 160 students. No philanthropic support was needed for that project because the fees charged to student residents will cover all of the cost of the building, which is projected at $11 million. Construction is expected to start in the spring.